The Barbados Open Water Festival (BOWF) 2018 once again takes place in beautiful Carlisle Bay. 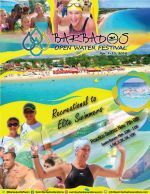 Open Water swim events (1.5km, 3.3km, 5km, 10km and 'Just for Fun' swim races) plus stand up paddle board races and kayak team relay races. A wonderful mix of recreational swimmers, competitive junior and master swimmers, triathletes, water polo players, swim club groups, Olympians, World Champions and elite swimmers will all line up together from start to finish. 4:30pm - Guided 2km Open Water Swim in Carlisle Bay. Dinner and Drinks available after at Copacabana Beach Bar. Dinner/Drinks available in an idyllic setting at the Port St Charles Yacht Club. Food, drinks and souvenirs on sale all day.